As current resource needs change and expand, the demand for – and energy available from – is abundant, renewable solar energy is also large. As companies seek more sustainable power and building solutions, IES Commercial and Industrial powers progress through electrical design, engineering, installation and maintenance of all solar technologies. As one of the nations largest electrical contractor, our experience and expertise with industrial and commercial structures ensure a solid understanding of your needs as you implement your renewable energy goals. Our trained technicians work with your team collaboratively to safely and reliably complete your project on-budget and schedule. 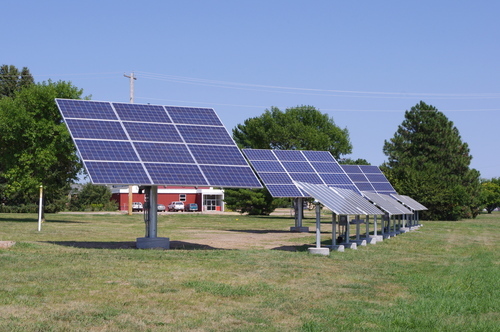 IESCI Holdrege provided support in installation of ground mounts, and power distribution for this solar field located in Hastings Nebraska. Solar services are offered through out the United States with a collaboration of our branch locations. IES Commercial and Industrial installed solar array and all supporting electrical systems for a 570 KW solar array on the roof of a new warehouse distribution facility in South Windsor, Connecticut. The system includes 2,641 solar panels and is expected to produce approximately 14 percent of the facility’s annual electricity demand. IES has installed the solar array and all supporting electrical systems for a 1.8 MW ground-mount fixed tilt solar photovoltaic array system for a healthcare corporate campus in New Jersey. Scope included a racking system, 25,000 modules, underground DC collections, inverters and AC feeders constructed on nearly 14 acres of the healthcare system’s campus. IES Commercial and Industrial has provided electrical contracting services for a 185-unit solar neighborhood in Nevada. IES installed all supporting electrical systems for the homes, including the rooftop solar panel arrays. They system uses a high efficiency solar cell to cover sunlight, an inverter to create electricity, smart meters connected to the grid and constant monitoring to lower electric consumption. The project represents the first residential residential development in the southwest portion of the United States to provide as a combination of solar power, LEED certification and Environments for Living (EFL) building methods.